Suddenly, China’s aircraft carriers will increase by 100%! 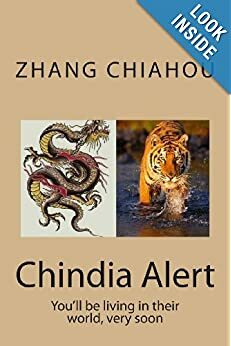 Singtao Daily reports Thursday: Sources say that China is now building two aircraft carriers, one of which, a new one entirely built by China on its own, will be launched next year at the earliest. According to experts, the major problem for China in building its aircraft carrier fleet is the lack of carrier-based aircraft. If that problem is resolved, China’s fleet of aircraft carriers will take shape sooner. Xinhua: “There may be no better time than today to observe how China will change in the future, as the Communist Party of China (CPC) is gearing up for a key meeting that will see a once-in-a-decade leadership transition in the world’s most populous nation. In a year of global elections, the world is closely scrutinizing the CPC 18th National Congress, to be convened on Nov. 8, and waiting to see how it will stand up to challenges facing the country and the CPC, as well as how it will influence the world at large. After more than three decades of rapid growth thanks to the reform and opening-up drive, China has ushered in an important era of transition in which the country must transform its economy and make it more sustainable. No matter how one views the event, the CPC’s 18th National Congress comes at a critical time for China, as the leadership it selects and the decisions it makes will have a profound impact on the world’s second-largest economy, and more importantly, on its people. The Chinese have experienced many such critical moments in the past century, during which time incredible changes occurred in the country and the CPC itself. One apparent distinction is that the CPC has grown incredibly large, with the number of members exploding from about 50 when the Party was founded in 1921 to more than 82 million on the eve of the CPC 18th National Congress, a number equivalent to the entire population of Germany. Since it became the ruling party in 1949, the CPC has suffered twists and turns, such as the self-inflicted Cultural Revolution from 1966 to 1976, but managed to restore China’s economic strength in the global arena through reform and the introduction of a market economy. Over the past decade, China has become the world’s fastest growing economy, with an average annual growth of 10.7 percent from 2003 to 2011, according to data from the National Bureau of Statistics. China took up about 10 percent of the world’s gross domestic product while contributing more than one-fifth of global growth last year. Yet unprecedented challenges are still ahead for the CPC, even though its top leadership has defined the current transition period as a time that is full of strategic opportunities to build China into a prosperous society by 2020. The CPC 18th National Congress comes at a time when the economy is facing mounting downward pressure after three decades of almost two-digit growth. The era of ultra-high economic growth will soon be fading in China, where policymakers will have to get used to an economy that expands by about 8 percent annually, according to a study conducted by a research team from the Chinese Academy of Social Sciences, a government think tank. 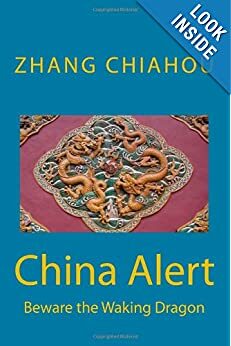 But the most pressing issue for the Chinese public is the uninhibited and widespread abuse of power and corruption among government officials and businessmen. A series of systematic and structural problems that have impeded the healthy development of the Chinese economy and society have yet to be resolved. Addressing problems that concern the people’s vital interests and giving more respect to the will of the people in making policies will continue to be a challenge for the CPC. Challenges have also appeared from outside, as the external environment has never been as complicated as it is now. Due to the deepening of the sovereign debt crisis and massive economic restructuring that occurred after the global financial crisis, developed economies may sink into long-term recession, thus creating new uncertainties and posing increasing risks for emerging economies like China. While maintaining the continuity of its policies, China must also adjust its relations with major powers, developing countries and neighboring countries according to the latest changes in the global situation. Any change in China will inevitably affect the rest of the world in an era of economic globalization. All of these problems and challenges will have to be addressed when the CPC’s 18th National Congress is convened. Hopefully, the CPC will draw lessons from its past successes and failures and establish a future direction for the country through resolutions on ideology-building, political routes and personnel management. via China at critical time as CPC congress approaches – Xinhua | English.news.cn. China Daily: “With the rapid development of China’s economy, Chinese consumers’ appetite for jewellery has continued to grow, resulting in consistent sales growth in the domestic market. In 2011, spending in China’s retail jewellery market reached 40 billion yuan ($6.3 billion), making it the world’s largest consumer market for platinum and jade, and the second-largest diamond jewellery consumer after the US. But in addition to being one of the world’s largest jewellery consumers, China has gradually emerged as a competitive jewellery maker in the international market. In fewer than 20 years, China’s jewellery industry has grown rapidly, and Shenzhen, a booming city in South China’s Guangdong province, has played a crucial role in leading this industry. Thanks to the influence of Hong Kong’s industry, the past two decades have seen Shenzhen evolve into China’s jewellery capital. Since the 1990s, the city has been acknowledged as China’s biggest jewellery manufacturing base and trade distribution center. According to the Gems and Jewellery Trade Association of Shenzhen, more than 2,000 jewellery companies now call the city home, and their annual output value of more than 50 billion yuan accounts for more than 70 percent of China’s overall jewellery production. In fact, the sales revenue of Shenzhen’s jewellery enterprises is not just ranked first in terms of domestic market share, it makes up about one-third of China’s total. But jewellers in Shenzhen are no longer content to remain the largest outsourcing base for brands from Hong Kong or other parts of the world. They are trying to reshape old business models by investing heavily in branding their own independently designed products, aspiring to upgrade Shenzhen from an international hub of original equipment manufacturers to the birthplace of famous jewellery brands. Some jewellers in Shenzhen have taken the lead in brand-building campaign. One of the most successful is Chow Tai Seng Jewelry Co Ltd, a large jewellery producer based in the city. Established in 1966, Chow Tai Seng Jewelry is now one of the largest diamond-jewellery retailers and wholesalers in China. It currently has the largest jewellery chain in the country, with more than 2,000 shops in more than 300 Chinese cities. via All that glitters is sold |Economy |chinadaily.com.cn. China Daily: “Bo Xilai has been expelled from the Communist Party of China (CPC) and removed from public office, according to a decision made at a meeting of the Political Bureau of the CPC Central Committee on Friday. The meeting also yielded the decision to transfer Bo’s suspected law violations and relevant evidence to judicial organs for handling. The decisions were made after attendees at the meeting deliberated over and adopted an investigation report on Bo’s severe disciplinary violations, which had been submitted by the CPC Central Commission for Discipline Inspection (CCDI). At a meeting held on April 10, members of the Political Bureau of the CPC Central Committee were briefed on the investigation into the incident in which former Chongqing Vice Mayor Wang Lijun entered the US Consulate General in Chengdu without permission as well as the reinvestigation into the suspected murder of British citizen Neil Heywood by Bogu Kailai, Bo’s wife. Based on Bo’s mistakes and responsibilities in the two cases, as well as evidence of his other discipline violations uncovered during the investigations into the two cases, the CPC Central Committee decided to suspend Bo’s membership in the CPC Central Committee Political Bureau and the CPC Central Committee and the CCDI filed the case for investigation. Investigations have found that Bo seriously violated Party disciplines while heading the city of Dalian, Liaoning Province, and the Ministry of Commerce and while serving as a member of the Political Bureau of the CPC Central Committee and as Party chief of Chongqing Municipality. Bo abused his power, made severe mistakes and bore major responsibility in the Wang Lijun incident and the intentional homicide case of Bogu Kailai. He took advantage of his office to seek profits for others and received huge bribes personally and through his family. His position was also abused by his wife Bogu Kailai to seek profits for others, and the Bo family accepted a huge amount of money and property from others. Bo had or maintained improper sexual relationships with a number of women. He was also found to have violated organizational and personnel disciplines and made erroneous decisions in the promotion of personnel, resulting in serious consequences. via Bo Xilai expelled from CPC, public office|chinadaily.com.cn. The Hindu: “GSAT-10, the country’s newest and heaviest satellite, was launched in the wee hours of Saturday from the Kourou launchpad in French Guiana in South America. It will directly boost telecommunications and direct-to-home broadcasting among others. The satellite, 9th in ISRO’s present fleet, will be operational in November and add 30 transponders to the domestic INSAT system, Indian Space Research Organisation (ISRO) said soon after the launch. The ISRO launched the 3.4-tonne spacecraft on the European Ariane 5 rocket as the agency cannot currently launch satellites of such mass on its own vehicles. The satellite and the launch fee cost the agency Rs. 750 crore. The ISRO called its 101st mission “a grand success,” adding that the satellite was in good health. via The Hindu : News / National : India’s heaviest satellite GSAT-10 launched. As the article below (and this one – https://chindia-alert.org/2012/09/27/japanese-car-plants-in-china-whos-feeling-the-heat/) demonstrates so clearly, today no country is an island. Economic inter-dependency means that compromise and pragmatism must win the day. However, the enmity between China and Japan goes back to the late 19th Century when Japan joined the eight nations that sacked Beijing, followed by the yet-to-be admitted by the Japanese atrocities of the Sino-Japan war. We can only hope that common sense will prevail. From afar (in the UK) one cannot see why China and its neighbours, including Japan, cannot agree to sharing the bounty of the sea and that underwater. Why should lines drawn on a map dictate that oil, gas or whatever lies beneath belong to one nation and not another? But then I was trained as an engineer and not a politician or lawyer! NY Times: “After allowing anti-Japanese demonstrations that threatened to spin out of control, China has reined them in and turned instead to hard-edged diplomacy over disputed islands in the East China Sea to lessen any potential damage the conflict might have inflicted on the nation’s softening economy and a delicate leadership transition. With relations between the two Asian powers at a low point, China decided to go ahead with a scaled-back reception here on Thursday night to honor the 40th anniversary of the resumption of their diplomatic ties on Sept. 29, 1972. A member of the Politburo’s Standing Committee, Jia Qinglin, attended with several other Chinese officials. Around the disputed islands in the East China Sea, called the Diaoyu by the Chinese and the Senkaku by the Japanese, a large flotilla of Chinese patrol boats was being monitored Friday by about half of Japan’s fleet of coast guard cutters, the Japanese newspaper Asahi Shimbun reported. The protests in more than 80 cities, including in urban centers where Japanese car dealerships and electronics plants were damaged, suggested that the Chinese leadership approved the outpouring of nationalism in part as insulation against criticism of the party itself during the transition of power that formally is scheduled to take place at the 18th Communist Party Congress, now set to begin on Nov. 8. But the protests threatened to turn against the Chinese government itself, diplomats and analysts said. Even though China has overtaken Japan as the biggest economy in Asia, Beijing’s handling of the dispute, precipitated by the Japanese government’s decision to buy three of the islands from their private Japanese owners, highlighted the interdependence of the Chinese and Japanese economies, and the limitations on what the leadership could allow. Notions of punishing Tokyo economically for buying the islands, whose status was left unclear after World War II, are unrealistic, said Hu Shuli, editor in chief of Caixin Media and one of China’s chief economic journalists. So many Chinese workers are employed at Japanese-owned companies, she said, that any escalation of tensions leading to a boycott of Japanese goods could lead to huge job losses. This would be disastrous in an already shaky Chinese economy, Ms. Hu wrote in the Chinese magazine Century Weekly. At a time when overall foreign investment in China is shrinking, Japan’s investment in China rose by 16 percent last year, Ms. Hu noted. The Japan External Trade Organization reported $12.6 billion of Japanese investment in China last year, compared with $14.7 billion in the United States. via China Alters Its Strategy in Dispute With Japan – NYTimes.com. * Japanese Car Plants in China: Who’s Feeling the Heat? WSJ: “Explosive anti-Japanese sentiment in China forced Toyota, Honda and Nissan to idle factories across the country this month. Media reports suggest that fresh shutdowns may be coming again in October. Halting production is never good news. But who’s got the bigger headache – the Japanese or the Chinese? There is no question that Toyota, Nissan and Honda will lose sales and market share to competitors. It’s already happening. And lost sales matter because China accounts for 15% of global profits at Toyota and Honda and as much as 25% at Nissan. And yet, the pain could become even greater for China. 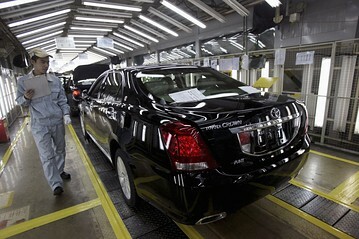 All Japanese cars made in China are produced at joint-venture factories owned on a 50-50 basis with Chinese partners. When the plant doors close, Chinese executives who run those joint ventures will immediately confront two frightening realities: a dramatic drop in revenue and tens of thousands of idle workers. Take Hong Kong-listed Guangzhou Automobile Co for example. GAC, a subsidiary of the powerful Guangzhou municipality, runs world-class car assembly joint ventures with Honda and Toyota that employs just under 13,000 people. Guangzhou Honda and Guangzhou Toyota also buy car parts from hundred of suppliers based in Guangdong province that employ tens of thousands of more people. Honda and Toyota products are sold through more than 900 dealers owned by Chinese business people. Count several more thousands of jobs there. As China steps its way through a delicate political transition expected to formally begin in October, the last thing the leadership in Guangzhou wants to deal with is a crush of workers with too much time on their hands. If an argument between workers at a Foxconn 2038.HK +0.78% plant in Taiyuan can trigger rioting by thousands, imagine what might happen should Guangzhou workers start wondering about future job security. via Japanese Car Plants in China: Who’s Feeling the Heat? – China Real Time Report – WSJ. WSJ: “Australia’s former prime minister and longtime China watcher Kevin Rudd said Thursday that China’s incoming leadership will be strongly reform-minded on the economy and usher in a new era of diplomacy in the region. The U.S. has sought to expand its influence in Asia to counterbalance China’s growing regional clout, announcing plans to increase its naval presence in the Pacific and sending top officials to canvass the region. Such moves have complicated relations between the two powerhouses, but Mr. Rudd—who said he spent much time with Mr. Xi when he was Australia’s prime minister—said he anticipates Mr. Xi’s rise will help alleviate such tensions. via Rudd Sees More Economic Reforms in China – WSJ.com. WSJ: “A riot involving 2,000 workers at a factory in the northern Chinese city of Taiyuan on Sunday night has once again shined a light on conditions at factories owned by Apple Inc. supplier Foxconn. The cause of the riot appears to have been a fight between workers that somehow escalated into larger-scale unrest. While the precise dynamics that led workers in the factory to run rampant remain unclear, it’s noteworthy that news of the incident comes with Apple recently announcing that advance sales of its iPhone5 have broken all previous records. The success of the iPhone and similar products means competition among companies like Apple and Samsung, both of which rely heavily on Chinese factory supply chains, is likely to increase. This increase in competition, in turn, will crank up pressures in factories whose workers are already struggling under harsh conditions. 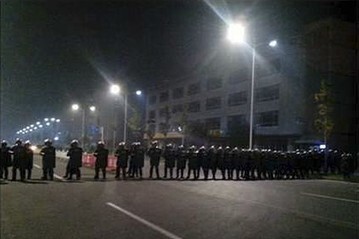 In this Monday Sept. 24, 2012 mobile phone photo, police in anti-riot suits cordon off a road near Foxconn’s plant in Taiyuan, capital of Northern China’s Shanxi province. The company that makes Apple’s iPhones suspended production at a factory in China on Monday after a brawl by as many as 2,000 employees at a nearby dormitory injured 40 people. via Working Conditions: The Persistence of Problems in China’s Factories – China Real Time Report – WSJ. Reuters: “China sent its first aircraft carrier into formal service on Tuesday amid a tense maritime dispute with Japan, a show of naval force that could worry its neighbors. China’s Ministry of Defense said the newly named Liaoning aircraft carrier would “raise the overall operational strength of the Chinese navy” and help Beijing to “effectively protect national sovereignty, security and development interests”. In fact, the aircraft carrier, refitted from a ship bought from Ukraine, will have a limited role, mostly for training and testing ahead of the possible launch of China’s first domestically built carriers after 2015, analysts say. But China cast the formal handing over of the carrier to its navy as a triumphant show of national strength — at a time of bitter tensions with neighboring Japan over islands claimed by both sides. Sino-Japanese relations deteriorated sharply this month after Japan bought the East China Sea islands, called Senkaku in Japan and Diaoyu in China, from their private owner, sparking anti-Japan protests across China. The risks of military confrontation are scant, but political tensions between Asia’s two biggest economies could fester. For the Chinese navy, the addition of carriers has been a priority as it builds a force capable of deploying far from the Chinese mainland. China this month warned the United States, with President Barack Obama’s “pivot” to Asia, not to get involved in separate territorial disputes in the South China Sea between China and U.S. allies such as the Philippines. U.S. Secretary of State Hillary Clinton in turn urged China and its Southeast Asian neighbors to resolve disputes “without coercion, without intimidation, without threats and certainly without the use of force”. The timing of the carrier launch might be associated with China’s efforts to build up patriotic unity ahead of a Communist Party congress that will install a new generation of top leaders as early as next month. via China carrier a show of force as Japan tension festers | Reuters.